As some of you may have heard, last week my dear and lovely sister-in-law said goodbye to this world and hello to the next, and passed away. Her name was Val and was my ex-wife’s sister, but I have known her for over thirty years and loved her like we were natural--born siblings. I miss her already. She had had two long years of struggle with numerous cancerous spots on her lungs and hips and brain and then about three weeks ago something changed within her and they started taking her down. I had intended to write up some lengthy stories about who she was and how much I had grown to love her over the years, but I cried so much in the typing that I couldn’t see the keyboard so I quit. Instead, I’ll just say that she and her husband, Biff, have both stood with me, and stood by me, during some very difficult days of my life, and I’ll always love them for that. 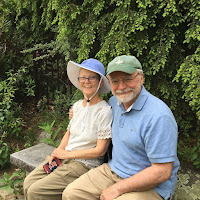 One of the greatest gifts I’ve received recently was getting to have dinner with the two of them about three weeks ago, just before she started to fail. Val was weak, she’d lost a lot of weight, and all of her hair, but she was still a sweetie, and still very gracious, and she still had her old snarky sense of humor. I've had some loved ones die suddenly and some die slowly, and they're all different, but they all hurt more than I like to admit. There's nothing noble, or beautiful, or fair, or magical about dying. It just is, and it hurts when you know you'll never again see someone who has touched you and loved you. In the big picture, it helps to know that Val, and countless others, are now in the hands of God and carried in the arms of God’s peace and mercy, but in the middle of the ache of saying goodbye, that doesn’t keep any of us from missing any of them. I think that if there is anything "beautiful" about the pain of death, it's that it only happens because there was a relationship of love that preceded it. It only hurts to see Val in death because I can remember seeing Val in life. I’m grateful for the tears because I wouldn't be having so many of them had I not been gifted by Val-the sweetie, who for so many years preceded them. And I am grateful too for all of the friends I have, both in this church and around the world. You are in my life bringing tears and smiles and support and humor when I least expect it. You lift each other up and cheer each other’s successes, and sometimes press “Like” buttons on Facebook when another loved one posts a picture of a grandchild or dancing puppy. What would we do without one another? And when one of you goes, I will cry with great sadness, but also joy because I’ll know that I was blessed to have known you. The more I get to know you here, the more I know that you are also a gift.